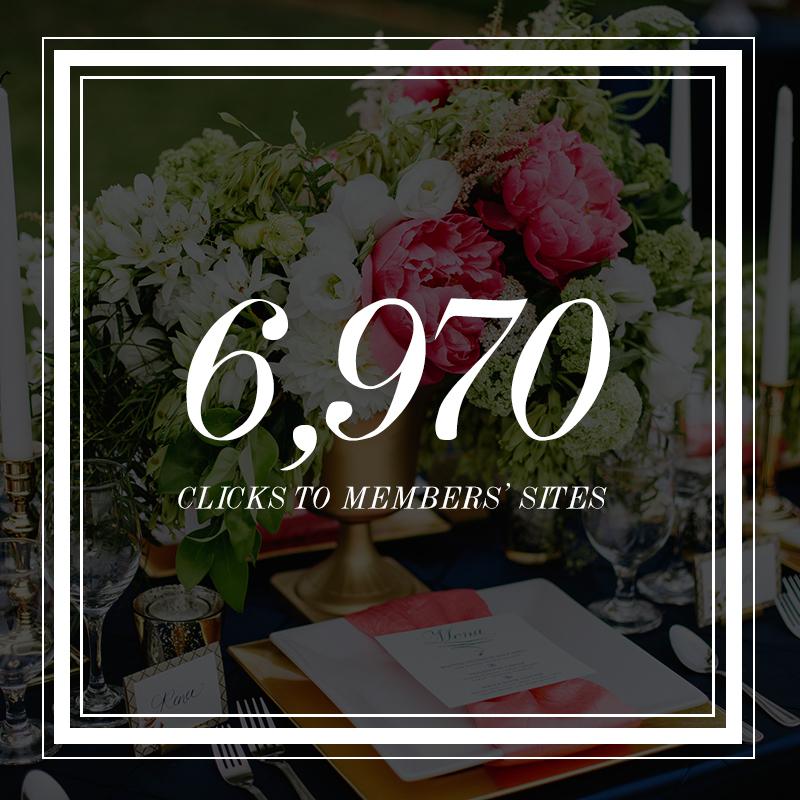 Total number of clicks we've sent to our members' sites between our launch on July 1, 2014 until April 20, 2015. In order to become a member, you have to submit an application but not before you read all the details on our advertising page. Once we receive the application, we go through it to see if you'd be a fit for our guide. We don't approve every single application that comes our way -- we actually turn down more than we accept but that's okay. We want to know that every single wedding professional in our guide is someone we can proudly stand behind and promote via our site and social media outlets. We want to know that our readers -- SoCal brides -- are getting the best. Once a member becomes approved, they have the opportunity to take advantage of a lot of different perks available to them only! Amy of ALL IN THE DETAIL DESIGN: "I was referred by Petals & Stones and knew immediately that SCB was going to be a perfect fit for my business. Although, being brand new in the industry I wasn't sure that SCB would feel the same way about me. I am so thankful and grateful SCB and editor, Damaris, welcomed me into the SCB family. Since then I have had the pleasure of getting to know Damaris and other SCB vendors. I had the opportunity to collaborate on a photoshoot for SCB and it was an outstanding experience. There are so many wonderful preferred vendors with such talent and passion. The features that SCB select are so inspirational and educational for any bride. SCB editor, Damaris' inner beauty shines bright. She is genuine, kind and humble. I enjoy learning from her, getting to know her and am thankful for the opportunities she has given me." Sarah of SARAH SOTRO PHOTOGRAPHY: “Over all, I just want to acknowledge that being a preferred vendor on SCB and working on the launch shoot has really opened doors for my business. I've been doing this four years now, and up to this point have felt stuck and in limbo. I still have so much to learn, but am also confident in my skill and eye as a photographer. Despite that, I was still discouraged because the bookings I did get were based on my "cheapness" and not because clients loved my images. I understand weddings are expensive, but it is still frustrating when you get the gig because a bride and groom just want the lowest price. Since working with SCB and being featured on the site I've received inquiries from couples who actually love and appreciate my work. It's a pretty awesome feeling. I've had four inquiries from SCB, 3 have been booked (I'm still conversing/meeting with the 4th). It's really helped to get my name out there in a flooded market, and add credibility to my business. SCB helps to direct traffic to my site from clients who actually want to invest in their wedding, and who are just as passionate about their photos as I am.